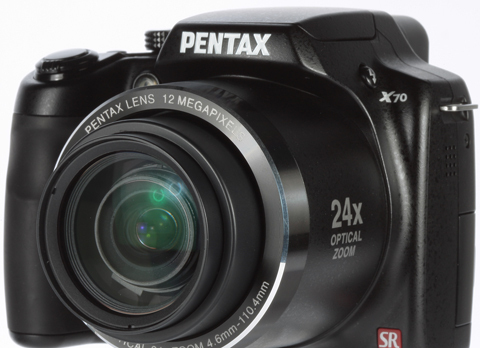 Pentax has revealed its first camera designed to bridge the gap between a compact camera and a digital SLR. The Pentax X70 features a 12-million-pixel CCD imaging sensor and a 24x, f/2.8, lens delivering the 35mm viewing angle equivalent of a 26-624mm zoom. A digital zoom boosts magnification to ‘150x’ to deliver the equivalent of a 3900mm, according to Pentax. Armoury includes Face Recognition, aperture and shutter priority and CCD sensor shift type Shake Reduction, which is designed to minimise camera shake. Priced £369.99 – and due to arrive in the UK this month – the X70 incorporates a nine-point AF system and a 2.7in LCD screen with a resolution of 230,000 pixels. It shoots JPEG format images only. Pentax claims that the lens can focus down to 1cm in Macro mode. The camera delivers a maximum burst rate of 11 frames per second (at a resolution of 5MP). Also on board the SD/SDHC memory card compatible newcomer is a 1280×720 pixel movie mode option. The photographer can manually set white balance and apply exposure compensation of plus or minus 2EV in 1/3 EV steps. The X70 boasts a top shutter speed of 1/4000sec and a spot metering option. Digital Shake Reduction makes use of the camera’s maximum equivalent ISO of 6400. A Digital Wide function aims to produce an extra wide angle image, equivalent to one delivered by a 20mm lens, by combining two separate photos. Photographers can choose from digital filter options including b&w, ‘fisheye’ and sepia. The X70 measures 110.5×82.5×89.5mm (excluding protrusions) and weighs 390g (without battery).